Older IL Drivers: Licensing Requirements and Safety | Hupy and Abraham, S.C. In 2013, drivers age 65 and older accounted for 17 percent all traffic fatalities. Thousands of older Americans were killed and hundreds of thousands were hurt in motor vehicle crashes. While older drivers may have more experience than younger drivers, there are other risks that drivers in this age group face. Specifically, older people may have vision issues, slower reflexes, and increased reaction times which can impact driving safety. Drivers under the age of 81 must renew their driver’s licenses every four years. Drivers age 81 to 86 must renew their driver’s licenses every two years. Driver age 87 and older must renew their driver’s licenses every year. 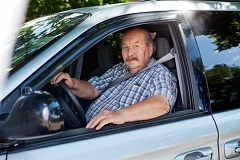 Drivers age 75 and older are required to take a road test each time they renew their license. Drivers age 75 and older must appear in person each time they wish to renew their license. The Illinois Secretary of State’s Office, AAA, and other organizations run programs to help senior citizens prepare for license renewals. These programs and the special license renewal rules for older drivers are intended to help prevent accidents caused by medical conditions or the natural effect of aging. While the Illinois driver’s license requirements for older drivers may help prevent some accidents, they will not prevent every accident caused by an older driver. For example, an older driver may have a change in medication or develop a medical condition between license renewals that could lead to an accident. Additionally, older drivers may cause crashes for reasons unrelated to their age; they could be drowsy, distracted, or drunk. Accordingly, it is important to know what to do if you’ve been hurt by an older driver, and it is important to protect your rights. For more information about how to do that, please read our free book, The Ultimate Guide for Automobile Accident Victims. What Kinds of Accidents Occur on Illinois Roads?